The year was 2011 and my friend had given me some band recommendations. I go through each band and cross each one off of the list, and then I get to a (then) three-piece indie band called The Front Bottoms, who is from New Jersey. I gave their song "Swimming Pool" a listen and I am instantly caught off guard. For starters, this band sounded nothing like the other bands on the list. I noticed that a whole variety of instruments are utilized and the vocalist doesn't have the greatest voice. I gave a few more songs a chance then moved on to the next band, relatively unimpressed with The Front Bottoms. Fast forward two years and I see that the now two-piece band has a new album called Talon of the Hawk being released on May 21. I could remember how I felt about the band two years ago, but I decided to give them another chance with this album regardless. I can say, without a doubt, that it was my best decision of the year so far. From the first song, I knew that I was going to love it. "Au Revoir (Adios)" kicks off the album with not only an excellent song, but it also carries a slightly humorous tone and it lifts my spirits every time I hear it. The off-tone vocals haven't changed a bit, but this time they didn't put me off. 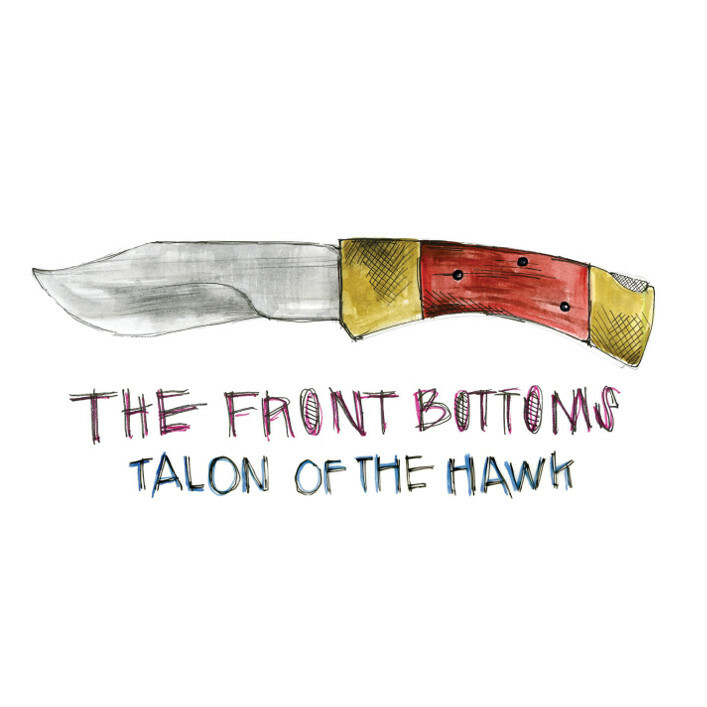 As soon as they drifted out of my speakers and wafted into my brain, it occurred to me that no other voice could fit The Front Bottoms' distinctive and unique style of playing. All of the bizarre instruments also make a return. For example, in "Au Revoir (Adios)," there is a tambourine, "Peach" makes use of standard clapping, and "Everything I Own" uses both a keyboard and trumpet. Musically, everything is fantastic. Each song has a memorable guitar part and the tone of the acoustic guitar fits perfectly. The drums in each song are on par, which gives the music the rhythm that it needs. It still astounds me to think that only two people wrote this entire album. The lyrics on Talon of the Hawk are my favorite component of the album. Each song tells a complete story that I can either relate to or get absorbed in as if the vocalist was just talking to me in a conversation. The lyrics range from silly lines such as "I got stoned/I fell asleep in the front seat/I never sleep in the front seat/I'm too tall," to more serious things like "I want to be stronger than your dad was for your mom." This band is one of the few bands that can make me feel a whirlwind of emotion in one song from their lyrics alone. Lyrically, this band is very similar to Modern Baseball, who I'm sure was strongly influenced by The Front Bottoms. The second track, "Skeleton," is another great song that features one of the catchiest choruses that I have heard in a while. Every time I listen to it, I have to sing along; I have tested and proved that it's an excellent song to sing along to with friends. The fifth track, "Santa Monica," is beautifully instrumentally, but the lyrics in the chorus are awkward. "Emotional baby boy, emotional man" is a very weird line to hear in a song. The final four tracks on the album are all tracks that blow me away. Each one features a strong, catchy chorus that I find myself humming throughout the entire day. The closing song, "Everything I Own," not only brings a few tears to my eye because of the strong lyrics, but also because it marches the album to a fantastic end. There are virtually no flaws on Talon of the Hawk other than one or two songs that I lose a little of my interest on. Every track on this album sounds different than the others. This album has been on repeat for me ever since it came out, and my entire city has heard it coming out of car speakers. This album has caused me to go back to their older album again and I've become infatuated with that as well. If The Front Bottoms come to your town, be sure to head out to see them and to support them.